Prior to the 2009 release, if you had a multi user installation the only way that you could tell if other users were using a company file would be if the program wouldn’t let you switch to single user mode, or by pressing F2 and looking at the # of Users Logged In counter. With this release we now have QuickBooks Messenger, a function that lets you see who is logged in, chat with them, and perhaps even log other users out so you can perform important single user functions. OfficeManager in this case is the login name of the other user, and any user already logged in will get this notice. See the Chat link? If you click that a chat window opens and you can exchange notes with the other user. You can also open this chat window by clicking the Chat with coworker option in the Company menu, or by right clicking the green QuickBooks Messenger icon in your Windows tooltray. In the first release of QuickBooks Messenger I’ve seen some problems with accessing features from the tooltray. For example, sometimes the list of users is not always up to date. Opening the chat window from the QuickBooks menu seems to be much more reliable. From either the chat window or the tooltray icon each user can set a status flag that tells other users that they aren’t to be disturbed, for a variety of reasons. Unfortunately, people can easily ignore the status of another user. If you have your status set to “Do Not Disturb”, everyone else will see that status by your login name, but they can still open chat windows with you and the announcements pop up on your computer. I’d rather have this prevent others from bugging me unless they are an admin user with priority. The real power of this feature, in my mind, comes with the features only available to the admin user. This user is the only one that has the Actions menu. Do you need to shut down the system for a backup, or server maintenance? 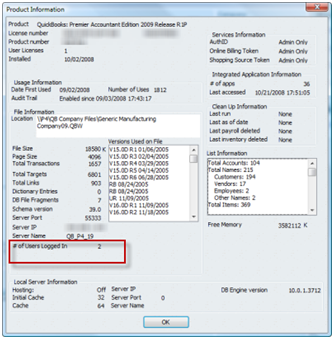 Do you need to move to single user mode to adjust inventory? Send a message to all logged in users. You will get a list of all of the users on the system, and you can select which should get the message. Ready to shut down the system, and someone still is logged in? Perhaps they left their desk, perhaps they went home for the day and left their copy of QuickBooks open (a very bad habit). In earlier versions of QuickBooks you had to run around to all of the workstations to find who was logged on, and get them out. That can be very time consuming. With QuickBooks Messenger you can close the company file for users – again with the option to select which users. The biggest limitation that you will run into is that this only provides communications between users who are actually logged in to the same Company file. If two users are logged in to separate files they cannot communicate. If you are not logged in to any company file, you cannot communicate. In some offices this will limit the usability of the product for things like telling people that you are going to perform maintenance on the serve, or to stay out of the company file because you want to do some work with it. Also, when you log someone off remotely, nothing prevents them from getting right back in to the company file (unless you have quickly changed to single user mode). Of course, you are notified that they are back in, but this can be annoying. As mentioned before, setting your status to “do not disturb” has little value, since others can ignore that and send chat messages to you anyways. There should be at least one status that lets you block out everyone else (except perhaps the Admin user). In the Intuit Live Community user forums I’ve seen a number of people complaining about QuickBooks Messenger. We often see this with new features – people aren’t used to it, they don’t understand it, they don’t want anything new. In some cases this may be true here – if you don’t understand how this works or why you might use this (particularly the admin functions) then it may just seem to be an annoyance. Windows XP and Vista are Preemptive multiuser systems – so a program can take over control of the keyboard from another program easily. 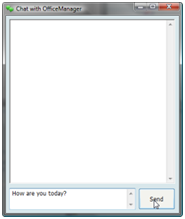 This sets up a situation where you can be typing information in a program and then have the Chat window pop up and grab those last several words you typed in. This can be annoying at the least, it can reduce productivity if you have a lot of people who are logging in and out, or who are just plain chatty. Everyone sees who is logging in and when they are on the system. As an administrator that might be very useful. For some people it creates an annoying view of their activities that they don’t want others to see. You may find people leaving their computer logged in to QB longer than necessary so that others think they are working even when they are taking a break, and that can be a security issue if you have information that should be protected in the office. In some offices having this chat window available leads people to engage in time wasting notes back and forth, interfering with the work that they should be doing. In some larger companies there are requirements that all interpersonal communications be logged and archived, and QuickBooks Messenger doesn’t provide the company with this kind of feature. Using it can be against company policies. 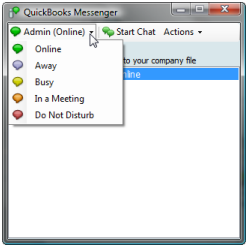 Starting with the R4 release of QuickBooks 2009 Intuit has added a setting that lets you disable QuickBooks Messenger easily, as I describe in this article. This is a great improvement. If you have an earlier release then the following steps can be used to disable the Messenger feature – although I highly recommend that you update to R5. 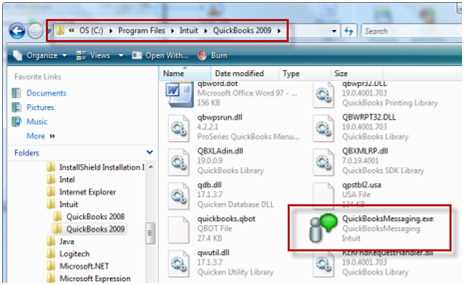 Look for a file named QuickBooksMessaging.exe in your QuickBooks program folder. For Premier on my system the folder is C:\Program Files\Intuit\QuickBooks 2009. You will find the program there. 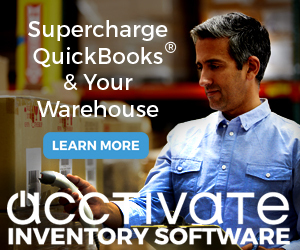 Make sure you are not running QuickBooks. Right click on that file and select rename and change the name to something like holdQuickBooksMessaging.exe. I recommend that you do not erase this file, in case you find that you want it later on. When you restart QuickBooks the program will not start the Messenger service. Note that you will need to perform this on each computer running QuickBooks. Thanks for the insightful look at the new feature. Obviously there is some further development that needs to be done (this communication has to be saved), but I think it deserves a cheer for heading the right direction. Thank you for this reviw of this new feature. We have a different neen- on ouQB Pro 2009 (and prior to that 2008, we cannot access QB Help. 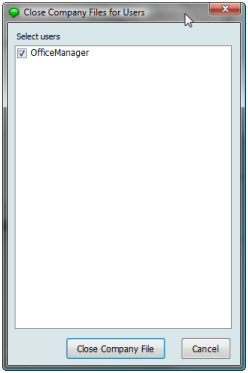 We only received at top of menu an html text message. We do not know what to do about this. Our computer person las looked at this, and it has been suggested to us to do a “repair” and if that didn’t work a “clean install”. We did do both of these,with no successful result. I have tried this fix twice this morning, and each time it just creates a new .exe file, and the messenger pops up when I re-open QB. Any suggestions? P Odom: That is very odd, I’ve not seen that happen. 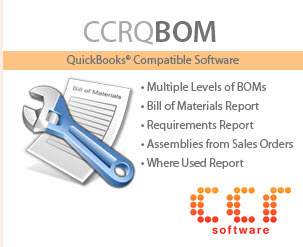 The EXE file isn’t created by QuickBooks – it is only created if you do an install or repair of the installation. Yeah – same here. We’re using QB Pro 2010. It just re-creates the file the next time you open QB. Interestingly, the file properties show the new QB Msgr .EXE file having the same creation date as the original one. Thank you for telling us how to turn this off. Nothing is more annoying than software that automatically installs features. I prefer when I am asked during setup if I want to custom install the software so I can shut off all the “extras”. Thanks for the update on how to disengage this feature. One user on our system receives a .net framework error (the same unanswered problem digitaldiva posted about on 11/06) everytime someone logs into QBES. Since we don’t use the chat features often (except to waste time), it will be beneficial to just turn it off. Does QuickBooks Messenger maintain the history of chatting sessions? HMB: As far as I know, it doesn’t keep a history. So it doesn’t provide archiving features that certain types of businesses require. Is there any way the admin can read the chats between users? Thanks for the wealth of information. Is there an audible alert for this program? The only way I know that there is a message is that I have to catch the flashing icon in the corner of the tool tray. If I am distracted, I may miss it. Dawn, I don’t believe that there is an audible alert. 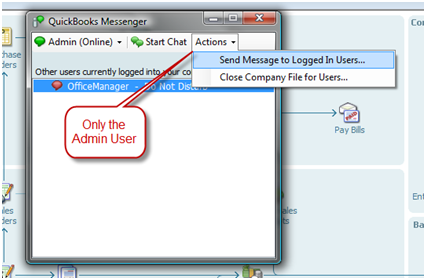 Quickbooks has added the feature to disable messenger in the latest version, QuickBooks 9.0 R5P. 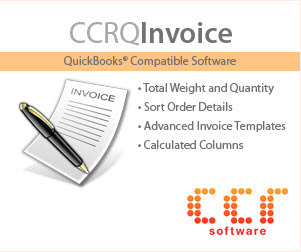 Hit F2 to see what version of QuickBooks you have. You must be the admin and in multi-user mode. Go to File, Utilities and you should see an option listed as Disable QB Messenger. QB MESSENGER has disappeared. I try to open it from the “Company” menu, but nothing at all happens. I had to do that a few times to be sure I was actually clicking, but I was. I do not believe it has been disabled, as we have been logged in all day. Mary, you don’t mention which year of QB you have. Or if you just did an update or something. I’d try rebooting your system. If it is gone for ALL workstations, reboot them all including the one that has the database. That is a first step. If I use a “Chat with Coworker function” in QuickBook to communicate, my boss, an administration log in, can view all of our chat, can’t she? I want to see previous conversation with my team. Can you retrieve chats between users if you are the admin? Thank you for sharing your experience, knowledge and wisdom. I have learned so much over the years. – The first file is good, messenger does not log me in. – The second file QB Messenger logs me in automatically which is OK.
— Popup that only one person can be in the bank feed. But we do not use it all. — I switch to single user that QB freezes. Waited for an hour with no luck. When I end the task it asks me to make a backup and logs me out of messenger. F2 shows only one user. Weird if QB freezes why would it ask me to make a backup? Why would it freeze on us? Unfortunately I don’t have an answer to you. I’ve not come across that kind of issue. What kind of environment is this? Windows 10 or older? Peer to peer network or Windows Server? Hosted QB?